By Bob Van Demark Jr. Wide Awake Anesthesia or WALANT (Wide Awake Local Anesthesia with No Tourniquet) has changed the practice of hand surgery. With no need for a tourniquet or sedation, a variety of surgical cases can be done in an outpatient setting outside of the usual hospital operating room suite. Wide awake anesthesia has been shown to be safe for patients, cost effective and has high patient satisfaction in several different practice settings (Leblanc et al., 2011; LeBlanc et al., 2007; Rhee et al., 2017; Tang et al., 2017). In November 2016, our group started doing wide awake hand surgery in an in-office procedure room. Surgery was done using the minor procedure room field sterility surgery technique described by LeBlanc, et al. (Leblanc et al., 2011). This included local anesthesia (1% Lidocaine with epinephrine) with no tourniquet or sedation. No prophylactic antibiotics were used, and patients wore their street clothes during the procedure. We modified LeBlanc’s protocol with the operative team using gowns during the procedure. 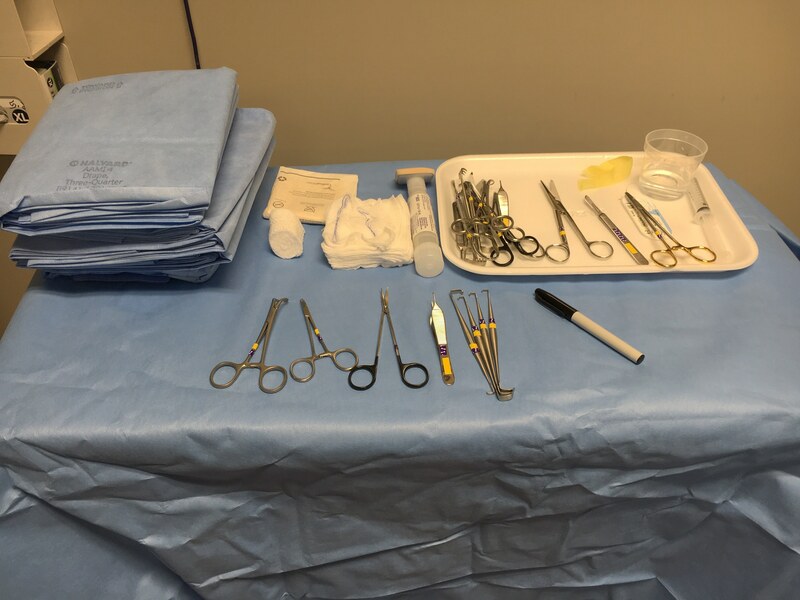 A smaller surgical pack was developed for the in-office procedures. The case mix included carpal tunnel release, trigger finger release, DeQuervain’s release, mucous cyst excision and nail bed repair. Between September 2015 and December 31, 2017, 370 cases were done in the procedure room. The superficial infection rate was 3.5% with no deep infections. All the infections cleared with oral antibiotics and local wound care. There were no secondary procedures done for this patient group. Of the treated patients, 99% rated their operative experience better or equal to a dental visit and 98% would recommend the experience to a friend or family member. Our clinical results mirror the experience of several authors who have published on WALANT. Previous authors have reported a low infection rate and high patient satisfaction (Leblanc et al., 2011; Leblanc et al., 2007; Rhee et al., 2017; Tang et al., 2017). Another advantage of the in-office procedure room is cost savings. The savings seen with no preoperative labs or medical evaluation are hard to calculate but are significant (Leblanc et al., 2007; Rhee et al., 2017; Tang et al., 2017). In a recent study, Rhee et al. reported their experience using an in-office procedure room at a military institution. The costs savings ranged from 70% for trigger finger releases and 85% for carpal tunnel releases. In a 9 month period, there was a total cost savings of $393,099.53 for 71 cases done in an in-office procedure room instead of the hospital. Patient satisfaction was high; 71% of patients felt less pain than a dental visit and 94% would do WALANT again for a procedure (Rhee et al., 2017). With WALANT anesthesia, a majority of hand surgery cases can be moved from a hospital operating room to an outpatient setting. 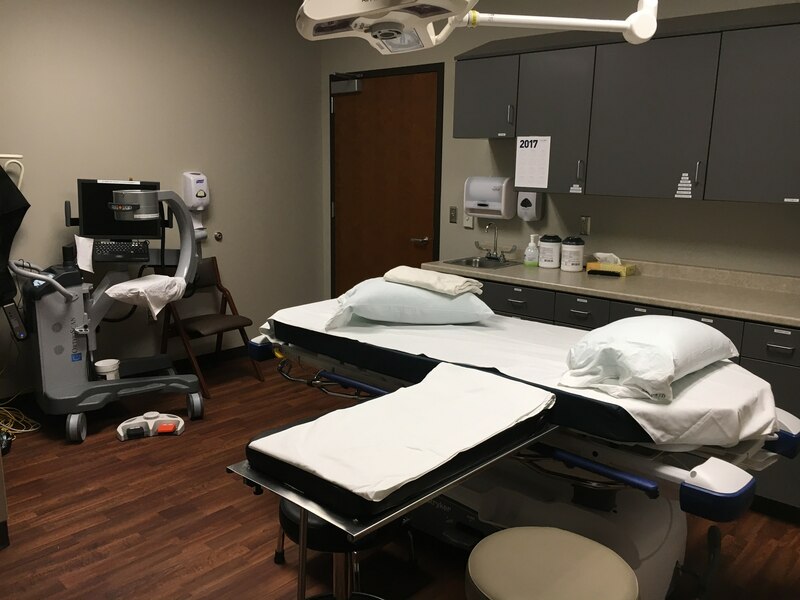 The in-office procedure room allows cases to be done in a cost-efficient manner while providing safe care with high patient satisfaction. 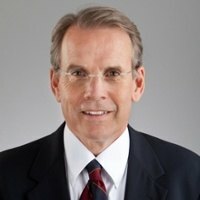 As we continue to see increasing pressure for cost savings and quality in health care, the access to an in-office procedure room will play an important role in the future of hand surgery. Learn more about how hand surgery can be performed safely, efficiently and cost-effectively on our about page. Read more about Walant on our blog. Learn all you need to know about Walant at our University. Leblanc MR, Lalonde DH, Thoma A et al. Is main operating room sterility really necessary in carpal tunnel surgery? A multicenter prospective study of minor procedure room field sterility surgery. Hand (NY). 2011, 6: 60–3. Leblanc MR, Lalonde J, Lalonde DH. A Detailed Cost and Efficiency Analysis of Performing Carpal Tunnel Surgery in the Main Operating Room versus the Ambulatory Setting in Canada. Hand (NY). 2007, 2: 173–8. Rhee PC, Fischer MM, Rhee LS, McMillian H, Johnson AE. Cost Savings, Safety, and Patient Satisfaction of a Clinic-Based Wide Awake Hand Surgery Practice: A Critical Review of the First 100 Procedures. Journal of Hand Surgery. J Hand Surg Am. 2017, 42: e139-e147. Tang JB, Gong KT, Zhu L, Pan ZJ, Xing SG. Performing Hand Surgery Under Local Anesthesia Without a Tourniquet in China. Hand Clin. 2017, 33: 415-24.